Pats Peak - Plan Your Visit - Beginner's Guide | Pats Peak Ski Area in Henniker, NH is southern New Hampshire's premiere ski area. 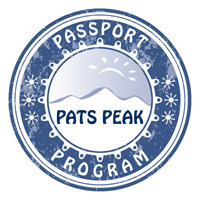 If you are new to Pats Peak or just starting out learning to ski or snowboard - WELCOME! Our "Beginner's Guide" is to help you with your first experience to be sure it's a great one! By reviewing this information you'll arrive at Pats Peak well prepared to begin your skiing or snowboarding adventure. Wear a base layer of long underwear. Warm collared shirt, sweater or fleece. Water and wind resistant pants. Snow or ski pants work best. Avoid sweat pants, they get wet very quickly! Be sure your pants are wide enough at the bottom of the legs to fit over large boots. High socks. Bring a couple of extra pairs of socks - the higher, the better. Avoid socks with big, thick seams, if possible. Gloves or mittens. Gloves allow more freedom of movement, but mittens are warmer. Avoid knit gloves, they get wet very quickly. Warm hat that covers you ears. The old saying "If your feet are cold, put on a hat" is true! Or you can rent a helmet in our Rental Shop or purchase a helmet in our Finish Line Ski & Board Shop. Eye protection. Either sunglasses or goggles. We sell goggles in our Finish Line Ski & Board Shop. The Pats Peak Finish Line Ski & Board Shop, conveniently located just steps from the slopes, carries everything listed above. Stop by the shop upon arrival to Pats Peak and our friendly staff will help you complete your outfit! We offer Kids Programs starting at age 3. Ages 3-5: Cub's Club, Child Care with outdoor play and an introduction to skiing for children ages 3-5 years old. Ages 6-14: Bear's Club, a fun filled learning environment with skiing or snowboarding with trained instructors from 9:30am-3:30pm. In order to provide enough instructors for our Kids Programs, we ask that you make reservations in advance. For all the details, view our Kids Program section. There is plenty of free parking at Pats Peak Ski Area. If you arrive early in the day, you will probably get to park very close the the lodge area. For later arrivals, there are unloading zones in front of the lodge and ticketing areas. Please be sure to bring everything you need from your car and lock your vehicle. For Cub's Club: Ages 3-5 or Bear's Den: Ages 6 and Up, you go directly to the location of the program to sign in. There you will find the lift tickets and rental equipment, if needed. Cub's Club is located on the lower level of the main lodge. Bear's Club is located in the Bear's Den, the buidling directly in front of you up on the snow as you go up the main entrance stair. If you are not part of the Kids Program, proceed to the Rental Shop if rental equipment is needed. Our Rental Shop entrance is on the bottom floor of the lodge on your right hand size in the plaza area. Enter our Rental Shop to equip you with the latest and greatest rental equipment. It is here where your journey to winter fun begins...Minor children under the age of 18 need to have a parent or guardian sign the Rental Agreement. The first equipment you are issued are your boots. The rental technician will need to know your shoe size to assure that your boots fit properly. Your boots should feel snug around your foot, but not tight. Once buckled, you should be able to wiggle your toes, but your heel should not move when you pull up on it. If your boots feel too loose or too tight, please do not hesitate to ask for a different size! Next, you will receive your skis. Our skis are expertly tuned and waxed. On the top of your skis you will find complicated bindings. These miracles of modern engineering not only hold your feet on the skis, but they also know when to let you go if you fall. A binding technician will set your bindings based on your weight, height, age, and ability level. Please be as accurate as possible to assure proper settings! You will also be issued ski poles - which are used for balance and moving around. A good fit on ski poles is to grab the ski pole that puts your elbow at a 90 degree angle. To use your bindings to attach your skis to your feet, place the little ledge on the front of your boot under the front binding piece (called the toe piece), line up your heel and press down. To get out, you simply press down on the lever in the back with your ski pole. If you ski comes off during skiing, the ski brake will stop it from continuing down the hill without you! Snowboards work pretty much like skis do. The big difference is that they are much wider, and you only get one. They have a sidecut just like skis, and turn the same way a ski turns. Snowboard bindings have one big difference from ski bindings - they don't release! Once your feet are in, they should stay there. Getting in your snowboard bindings is easy, you put your foot as far back in the binding as possible, push the plastic ladder strap into the end of the main strap with the buckle on it, until the ratchet clicks and the straps will not come apart. To tighten the strap, pull the large lever on the buckle back and away from the boot. Then let the lever spring back to position and repeat until the strap is tight enough. The straps should generally be quite tight so that the boot cannot move much in the binding, although not so tight that your circulation is starting to be cut off. To release the binding simply push the release catch in the middle of the buckle forwards and pull the main strap away from the plastic ladder strap. The release catch lifts the ratchet off of the ridges on the ladder strap so that the straps can slide smoothly apart. When loading a lift, you will take out one of your feet out of your binding and keep the other one in. In your lesson, you'll learn all of the basic skills that you need to get started on a lifetime of skiing or snowboarding fun! The first thing you will learn is how to put on your skis or snowboard and how to move around on the flat. This will give you a chance to get to know your equipment and get the feel for sliding around. You will also learn how to climb up the hill and turn yourself around while standing still. All of these skills are presented in a very flat area with a "runout". A runout helps you stop yourself while you are learning. Next you will learn to slide straight down the hill. Unless you are an ice skater or in-line skater, your brain has been programmed to believe that sliding across the ground while standing up is, as a rule, something to be avoided. It takes a few runs down the hill before your brain figures out that it is not only OK, but a lot of fun. Once you have mastered "straight runs", you will be taught how to turn your skis or snowboard. Turning offers two benefits - it allows you to avoid things you do not wish to meet up close, and it allows you to stop whenever you want - both commendable goals. Your rental skis or snowboard are designed to turn easily so you'll be happily turning in no time. Once you get to the point that you can go where you want to go and stop yourself with confidence, it is time for your first lift ride. If you have ever sat on a porch swing, you have mastered the art of loading and riding a chairlift. As you slide out onto the loading area, the chair will come up behind you. When the chair touches the back of your legs, simply sit down and enjoy the ride. Get more details on how to load the Peak Triple Chairlift with the loading carpet. There is a restraint bar that you pull down in front of you for the ride, please use it. At the top of the lift, you will see signs instructing you to raise the restraint bar and prepare to unload. The snow will gradually come up to meet your skis or snowboard. When you get to the "Unload Here" sign, stand up, lean slightly forward and slide straight down the ramp. When you take your first look down the hill, you may feel like you have been deposited on the summit of Mount Washington - don't worry look for the "easy way down" sign" and take that way down. There is plenty of free parking at Pats Peak Ski Area. If you arrive early in the day, you will probably get to park very close the the lodge area. For later arrivals, there are unloading zones in front of the lodge and ticketing areas. Please be sure to bring everything you need from your car and lock your vehicle. Your first stop is the Rental Shop. Head towards the lodges and enter our Rental Shop to equip you with the latest and greatest rental equipment. It is here where your journey to winter fun begins...the Rental Shop entrance is on the bottom floor of the lodge on your right. Minor children under the age of 18 need to have a parent or guardian sign the Rental Agreement. Our Starter Special package is a great way to learn! On the 4th day of the program, receive a FREE PATS PEAK UNLIMITED SEASON PASS and FREE DAILY USE OF RENTAL EQUIPMENT for the remainder of the season! Use of Rental Equipment is based on availability and not available for Saturday Night POP. Plus, receive 50%-Off additional Group Lessons at Pats Peak Snowsports School. Free Pats Peak Unlimited Season Pass is valid for the remainder of the current season. Lessons do not need to be consecutive but this program needs to be completed by the end of the current season. There are no refunds if the program is not completed by the end of the current season. Another great option is to pre-purchase the Passport Program PLUS for additional savings! Pats Peak Unlimited Season Pass is valid for the remainder of the current season.